Cheers to the Champagne Season! The history of Champagne has many, many chapters about a small community of people living in a demanding climate and subjected to centuries of invasions from the Barbarians, Crusaders, Prussians and Germans and the triumph over these adversities to create the most prestigious effervescent wine. It all began with the Romans who first planted vines around 57BC. But it wasn’t until the eleventh century that Champagne made its first big splash. What happened was a great honor – the son of a vigneron from Chatillion–sur-Marne was elected pope. It was well known to gain audience to his holiness, a case of Champagne would ease the way. Sales of the vins François, a sweet, pale red to pinkish brown still wine increased. Champagne was first famous for its fine quality wool and being strategically placed, became a commerce center generating trade fairs that attracted merchants from Belgium with lace, Russian furs, Italian leather, Mediterranean oils and wool from France. But not wine; that was made to accompany the shepherd’s meals. By the 12th century, wool producers who made wine on the side came up with a novel idea. To entice trade fair visitors to buy their wool, they decided to provide free wine. It was in 1668 that the wine trade started to overtake the wool industry. 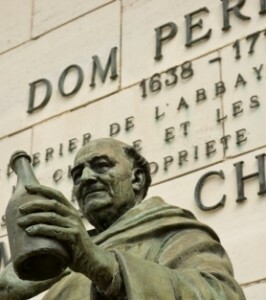 That’s when Dom Perignon arrived at the Abbey of Hautvillers. Louis XIV was sitting on the throne. The two had little in common other than being born the same year, dying in the same year and their love of Champagne. And both did a great deal to launch Champagne on its path to prominence. At that time, the wine was pale red, cloudy from the leftover yeast, sweet and still. Due to fermentation with wild yeasts, no knowledge that yeast even existed and with a colder climate than most wine growing regions, fermentation would go dormant in the winter. But as temperatures warmed up, fermentation would begin again. Yeasts would consume the unconverted sugars and because there was a cap of sorts, bubbles were trapped until the pressure was great enough to explode. Therefore, bubbles were considered a flaw, the devil’s brew. And that he did. He set down the golden rules of winemaking: Use only the best grapes, prune vines hard in the early spring to avoid overproduction; harvest in the cool of the morning; press the grapes gently and keep each pressing separate. He was the first to use cork rather than a wooden peg wrapped in an oil soaked rag. It was the finest still wine that Louis XIV drank and what the king drank, his subjects drank. In the late 1700s, a key Champagne house emerged – Veuve Clicquot Ponsardin. 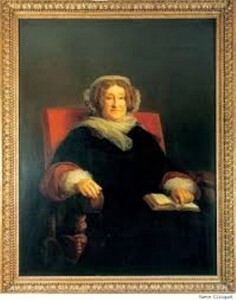 Barbe-Nicole Ponsardin was the daughter of an affluent textile businessman who lived next door to Philippe Clicquot who also ran a successful textile business in Reims. Clicquot had a son Francois, so Mr. Ponsardin and Mr. Clicquot did what any shrewd business owner in the 18th century would have done: arranged a merger. As the newlyweds, Francois’ interest in his family’s wine business grew. All was well until 12 years later, Francois died suddenly and Barbe-Nicole became the veuve (widow) Clicquot. Her father in law allowed her to continue the business perhaps recognizing a woman with business sense. Her small business thrived until the Napoleonic Wars crushed business. Facing bankruptcy, Veuve Clicquot took a huge gamble. She knew that the Russian market, when the wars ended, would be thirsty. If she could corner that huge market, success would be hers. Despite the naval blockades, she smuggled her wine to Amsterdam, where it waited. As soon as peace was declared, the wines were shipped – ahead of her competitors by weeks. When sweet Champagne debuted in Russia, Tsar Alexander declared it to be the best. His order was huge – 23,000 bottles. And his subjects followed suit. Veuve Clicquot would need to improve production to keep up with the new demand. When the yeast digests the sugar, it produces alcohol in the primary fermentation and carbon dioxide, better known as bubbles, in the secondary fermentation. The problem was the sediment – the dead yeast cells in the bottom of the bottle gave the wine its cloudy look. The Champenois removed sediment by pouring the wine from one bottle into another, a time consuming, wasteful process. Veuve Clicquot developed a better method. Instead of transferring the wine from bottle to bottle to get rid of its yeast, the bottles were turned upside down and twisted, shaking the dead yeast into the neck of the bottle where it could be easily expelled and the bottle topped up. 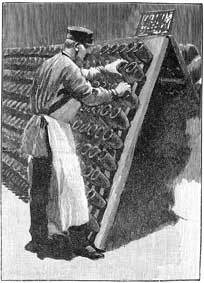 This method, known as riddling, is still used today. It would be a long time before any of the other Champagne houses became wise to the riddling method, giving Veuve Clicquot an advantage. Charles Heidsieck grew up in Reims and in 1851 at the age of 29, founded his own Champagne house. The house of Charles Heidsieck focused on selecting, blending and ageing wines to produce higher quality champagnes, and buying grapes from individual growers. He was successful selling to Belgium and England and in 1852 became the first merchant to market his own Champagne in the United States. He became a social sensation with one New York newspaper describing him as “Champagne Charlie”. He traveled to New York three more times until the Civil War disrupted trade. In 1862, he returned to recover his debt from his New York agent but the agent refused payment on the grounds Congress had passed a law absolving northerners of all debts to southerners. Desperate, Heidsieck secretly traveled to New Orleans to recover his money directly from the merchants but found them bankrupt. One merchant, however, did have a warehouse full of cotton and Heidsieck accepted that as payment. His use of blockade runners to smuggle the cotton out had him arrested for spying and imprisoned. At the intercession of President Lincoln, he was released and returned to France very sick and bankrupt. Shortly thereafter, the brother of the agent sent a messenger to Reims with a bundle of papers. He was paying his brother’s debt in the form of land deeds to a small town in Colorado called Denver. With the money from the land deeds, he was able to pay his debts and purchase several old chalk quarries, called crayères which dated from the Gallo-Roman era. These were used for riddling while the wine matured. Today, all Champagne houses use the crayères to mature their wines. During World War I & II, most Champenois lived for years in the crayères. Wishing you a very Happy Holiday!